On Saturday, April 26, Troop 50 joined with other Saugahatchee District Cub Scout packs and Boy Scout troops for ScoutFest -- an expo-style demonstration of Scouting in Lee County that is now in its second year of being a part of the City of Auburn's annual CityFest event. ScoutFest provides district packs, troops and crews the chance to put Scouting skills on display while increasing awareness of Scouting in Lee County. The troop's display consisted of a model campsite that included a lashed gateway and a fully functioning trebuchet -- the latter being a reprisal of the troop's 2013 ScoutFest display. 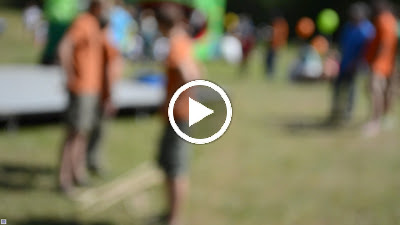 In addition to its campsite and trebuchet display, a three-Scout team from Troop 50 competed in the initial segment of the “Are You Tougher than a Boy Scout” stage show, which pitted Scouts against a team of three adults from the crowd. The two teams competed to see which could best master various Scout skills, including lashing together a tripod, pitching a tent correctly, and creating a functional emergency stretcher that could then transport a "victim" across the finish line. Troop 50 Scouts clearly won the tripod and tent-pitching competitions, but perhaps in a show of mercy to the adult team, show staff called the adults the winner of the emergency stretcher relay.